Sarah and Greg set out to critically explore American culture, compassion, and fear by relying on the kindness of strangers for a home each night. Traveling through 30 states in 60 days, they spend every day in a new town, learning why people may or may not be willing to open their homes. 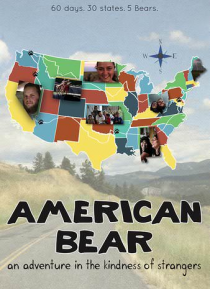 At times funny, heartbreaking, and inspirational, American Bear captures Americans yearning for face-to-face c… onnections and navigating the risks inherent in sharing their stories with strangers.